Induction Cooktop Consumer Reports can help you determine which induction burner is best for you. We reviewed 3 units here but our full list of induction cooktops can be found here. Are you are looking for the best portable induction cooktop ? There are many options that will suit you well. In any case, the most important thing to know is that a portable induction cooktop is affordable, effective, and capable of cooking more efficiently than a gas or electric stovetop. The only downside is that you have to use specially designed cookware to be able to deactivate most induction cooktops’ auto shutdown feature. Each of the portable induction cookers below is carefully selected and widely considered by many to be the best portable induction cooktops. If you want to find an induction cooktop that is capable of fitting in tight quarters and easily being whipped out to create an excellent recipe, this list will serve as a great reference in helping you find the best portable induction cooktop. If you want a portable induction cooktop that can operate at high temperatures, the Nuwave PIC 1800W Portable Induction Countertop Burner is one of the best options for you to consider. With the ability to go up to 575° Fahrenheit, this product will be able to cook just about any sort of meal that you desire. This product will also automatically shut down after 10 seconds if it doesn’t detect any pots or pans on top of the device, which is great for saving electricity and preventing accidents. Since it has a 12.3” cooking platter and a 50-lb. weight limit, you will be able to handle a heavy load of food each time you use this product. There are some things to keep in mind if you want to purchase this model. First, you will have to purchase specially designed NuWave or induction-ready cookware in order for this product to work. Since its automatic shutoff will not work if it doesn’t detect this types of cookware, you simply won’t be able to use the product without them. Also, it’s important to keep in mind that this model isn’t the most affordable or smallest product on this list. However, if you want a high-quality, portable induction cooktop that you can depend on for over a decade of use, and have space for a couple extra inches, this may be your best option. The Secura 9100MC 1800W Portable Burner is one of the most affordable options for a portable countertop burner. Like any of the best portable induction cooktops, this burner supplies power up to 1800 watts and can provide enough heat to cook most meals. With temperatures ranging all the way up to 460° Fahrenheit, water will boil in minutes and meals will be ready quickly. If you want an affordable portable countertop burner that contains most fancy features such as multiple power levels, customized temperature control, silent cooking, and a decently sized cooking platter, this should suit the needs of anybody who wants a simple, yet effective countertop burner. The small size and affordable price of this model are what make it considerably attractive when you compare it to the other products on this list. Since it comes with most of the features that you can find in the most expensive portable induction cooktops, yet with a more affordable price, many people will consider this model over the others on this list. However, like many other portable induction cooktops, you will need special cookware to use this product, since it detects cookware and has an intuitive auto shutoff feature which will set off if you don’t use Duxtop or other induction ready cookware. The Fagor Portable Induction Pro Cooktop stands apart from other products on this list with its attractive design made from glass. Due to its glass platter, it is very easy to clean and is resistant to sticky burned-on residue resulting from spills. Since it is easy to clean and made on one flat surface, cleaning the platter before and after use is very easy to do. With 8 different temperature controls that are designed to help you know which level of heat you need. With the highest level reaching around 465°, you will likely not need any more heat than this. Additionally, this product is capable of heating up around 50% faster than other gas or electric stoves and processes the energy it harvests very efficiently. It uses 90% of the energy produced, which is impressive. This portable induction cooktop is best for the person who wants a stovetop that is easy to clean, lightweight, and attractive. It is very slim, making it easily stored away. However, keep in mind that the buttons and screen are placed close to the cooking platter. Due to the nature of the design, you might naturally not be able to see the temperature of your platter when you use a pan larger than 12”. 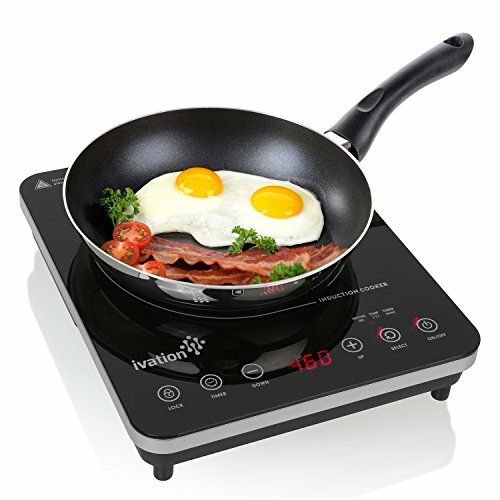 If you want a smaller portable induction cooktop burner, look no further than the Ivation 1800W Portable Induction Cooktop. Like most other portable induction cooktop burners, this product can heat up 50% faster than gas or electric stovetops, allowing for a fast and easy cooking experience. Additionally, there are 10 different power levels on this device which can be easily navigated by using the screen display. The buttons are far apart from the cooking platter, and very easy to understand and operate. This is a very energy-efficient product, which means that you will use most of the power that goes into the machine. The total energy savings you will experience is 70% when compared to gas or electric stoves. However, there are a few things to note about this machine which may not be ideal. For starters, you will need to use induction-ready cookware or this device will not properly operate. Additionally, if you like using a 12” cooking platter, you won’t be able to; this product only accepts cookware ranging from 4.75”-10.25” in diameter. Lastly, the countdown timer which operates in 5-minute increments is rather long when you compare it to other top portable induction cooktops. 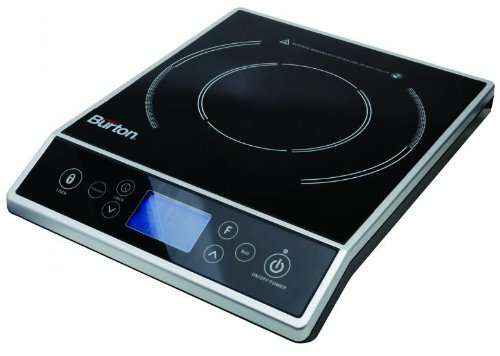 The Max Burton 6400 Digital Choice Induction Cooktop is worth mentioning due to its modern design and attractive LCD display which is much easier and clearer to see in low light. It is capable of heating up to levels which most people will need and has nice increments of 25° so that you can fine tune what temperature you would like to cook at. Since there is a lock feature, you will never again have to worry about your child coming up and adjusting the temperature to mess with you. The same goes for friends and family; just be sure not to show them how to use this feature. Whether you want to use this portable induction cooktop for warming up dishes, or quickly boiling water, you will be highly satisfied with its powerful and energy-efficient design. As with other induction cooktops, make sure that you have the right cookware before pressing the “buy” button. The worst thing you can do is purchase one of the best portable induction cooktops like this one and not be able to use it since you have the wrong cookware. Also keep in mind that although this model is very nice, that it is also more expensive than other models on this list. If you want to have a portable induction cooktop with all of these features (with the exception of the LCD display and hold setting), it is still possible for less money. The Secura 8100MC 1800W Induction Cooktop is another reasonably priced option that you might consider if you want a portable induction cooktop that is capable of providing most of the features that you are looking for in a portable induction cooktop. This product has a digital display, which isn’t entirely attractive, but still capable of providing insight into the temperature. There are also buttons and 10 different power levels which will help you select your temperature with a decent degree of precision. Considering the price of this product, you are getting a pretty good deal when you look at the specifications. 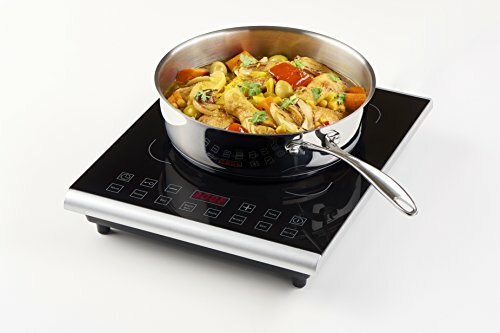 If you are okay with having less precision when you are selecting your temperature, but still having the ability to reach temperatures which can compete with any of the best portable induction cooktops, this is a great product to purchase. However, keep in mind that this isn’t the fanciest or best-looking induction cooktop by any means. Although it is capable of matching up relatively well to other models regarding specifications, the aesthetics are not as eye-pleasing. Also, the buttons and screen are located pretty close to the cooking platter, which can get in the way of an induction-ready cookware device that is rather large. If you want an affordable portable induction cooktop which comes with plenty of added accessories, this one might be your best bet. 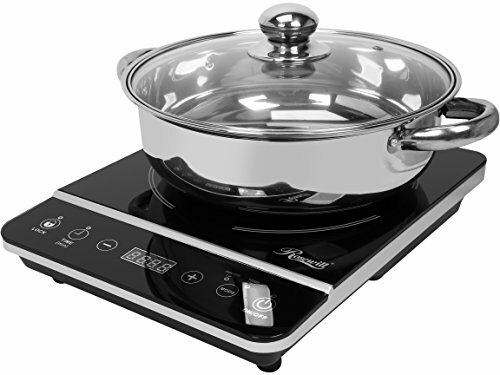 The Rosewill RHAI-13001 1800W Induction Cooktop comes with an induction-ready stainless-steel pot and provides the same amount of power as the other models on this list. Since it has 8 temperature settings ranging from 150°-450° it can compete heat-wise with just about any other model in this category. It is also equipped with a three-hour countdown timer which provides enough time to count down the cooking process for most meals. The polished crystal plate surface is attractive considering the price that you are paying for the cooktop and stainless steel pot. There is also an LED screen and button controls for helping you navigate through the temperature controls. However, keep in mind that since there are only 8 options, you won’t be able to precisely choose your temperature very easily. Like other induction cooktops, you will also need to purchase cookware that is induction ready if you want to use other pots than the one provided. However, many people might be fine with simply using the included products for the life of this product. If you want an affordable induction cooktop and need cookware to go with it, this is your most affordable and high-quality option. Anybody looking for a nice balance between features and price should check out the Duxtop 1800W Portable Induction Cooktop Burner 9600LS . This product is equipped with 20 different heat levels for easily pinpointing the precise temperature that you want to use, and ranges from 100-1800 watts of power. It is capable of heating up to levels that most induction cooktops can, up to 460°F without taking too much time. It also has an impressive 10-hour countdown timer which can countdown with 1-minute increments. This will come in handy when you need to use your induction cooktop for slow-cooking, or for extended periods of time and need to keep an eye on the time. The LCD touch controls and easy-to-press touch buttons are other features which really make this product stand out. Since there is a 1-year manufacturer’s warranty, you won’t have to worry about this product breaking down, at least for a little while. If you make sure to clean and maintain your device you shouldn’t have any problems using this device. Just be sure to use induction-ready cookware otherwise this product won’t work. This is a standard feature for induction cooktops, but still worth mentioning. Another thing to keep in mind is that if you want to use the lower settings, you should keep an eye on it since there is a rare report that low levels of heat don’t work properly. 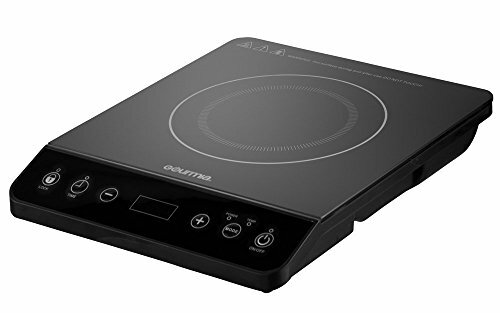 If you are looking for a portable induction cooktop that has 8 levels of power and 1800W of maximum power, the Gourmia GIC200 Multifunction Digital Portable Cooktop is a great option to consider. Since it has many of the options of the best portable induction cooktops and one of the lowest prices of any other product on this list, this is a great product for anybody who is on a tight budget but wants a high-quality induction cooktop. One feature that is particularly nice about this product is that it is easy to clean and resistant to sticky messes. This will come in handy when it is time to do dishes and the last thing you want to do is scrub away for several minutes at some random gunk on your cooktop. If you want a portable induction cooktop that can match up with any of the best portable induction cooktops, but don’t want to pay the extra money, this might be your best option. Just keep in mind that having only 8 levels of power which can go up to 460° may seem like enough, but can be hard to use when you want precision for your temperature levels. Also make sure that you have induction-ready cookware such as stainless-steel pots with a magnet on the bottom, cast iron, or other products recommended by the manufacturer. In any case, make sure to clean and properly maintain this device since more affordable products tend to be easier to break down. Since it has a glass design, this cooktop is very easy to clean once you are finished cooking. Glass ceramics are capable of storing pretty impressive levels of heat, making this a very great material for induction cooktops. If you need to use a timer while you are cooking, you can use the countdown timer from up to 150 minutes in length. This is the only product that has a maximum of 1600 watts of power, as opposed to 1800 watts. However, this doesn’t affect the temperature output of the machine, which still maxes out at 450° Fahrenheit. Like other induction cooktops, be sure to purchase a product like a stainless-steel pot with a magnetic bottom, or a cast iron product which is induction ready. One final thing you should keep in mind that this product weighs a little more than a typical induction cooktop (7.4 lbs.). If you want the best portable induction cooktop, and money is not an issue for you, your best option might be the Duxtop LCD 1800W Portable Induction Cooktop Burner due to its precise temperature control, many different power levels, and crystal-clear LCD display. 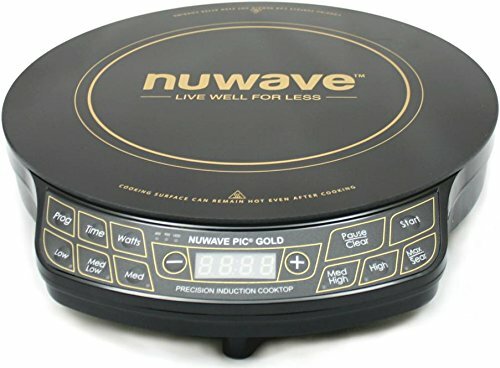 Some people might consider the Nuwave PIC 1800W Portable Burner to be the best portable induction cooktop since it has 94 different temperature controls, a beautiful LCD display, a 12.3” platter, and a long lifetime of use. Depending on your preference and budget, you may prefer this one over the Duxtop model. If you value the affordable nature of a portable induction cooktop over having a ton of different fancy features, nice LCD screens, large cooking platters, and so on, then the Gourmia GIC200 Multifunction Digital Portable Cooktop is a great option for you. This model produces a great deal of power for a very reasonable price. However, just keep in mind that using a precise temperature setting is very difficult with this model. Since it only has 8 different power levels, don’t even think about having as much precision with your cooking as you would have with other models. In the end, the best portable induction cooktop depends on your personal preference, budget, and the features you desire the most. If you balance of all of these factors, any of the other above options will suit you well. To help you make an informed purchasing decision, let’s first go over some basics as to what makes a good portable induction cooktop. It is important to realize that you don’t want to simply purchase the most affordable one you can find, otherwise, you might find yourself needing to buy another in the near future. The best portable induction cooktops usually have the same features and are within a certain price range. Induction cooktops work by heating the cookware and not the cooking platter, which makes them very energy efficient. This is the first and foremost thing to understand about this product. As a result, they are considerably efficient when processing energy compared to gas or electric stoves. How much power does a good induction countertop need? 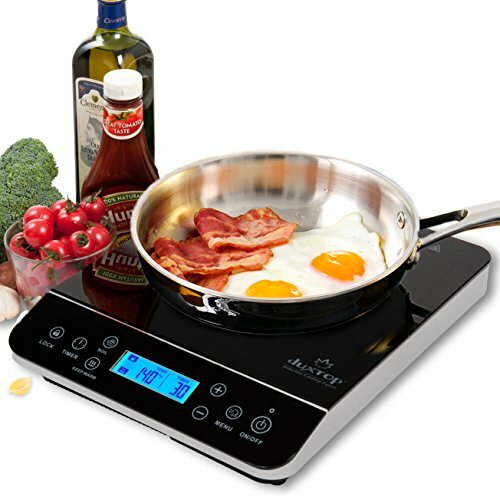 You will probably purchase a portable induction cooktop with 1600-1800 watts of power. When you consider that most cooking temperatures don’t go any higher than 400°- 600°F, any portable induction cooktop will provide more than enough power in most circumstances. A good rule of thumb is to consider what you need to make with your induction cooktop. Of course, something like steak requires a lot more heat than boiling water for noodles. If you don’t need that much temperature or power, then you don’t necessarily need the most elaborate and expensive portable induction cooktop. However, in any of the options below, we have only selected options with 1600-1800W so that you can use these portable induction cooktops for anything. 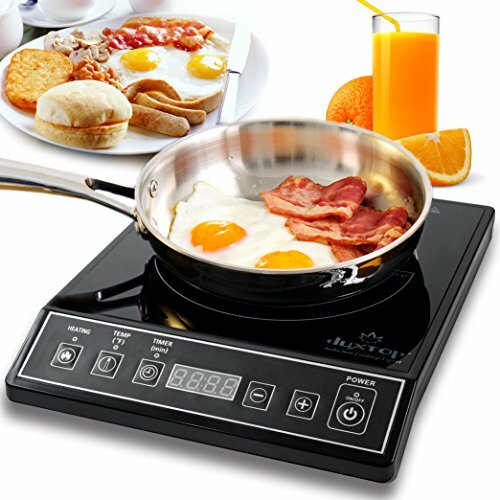 How much cooking space does the typical portable induction cooktop have? Since you want a portable induction cooktop, defining your dimensions for portable should be the first thing to do. Typically, manufacturers will produce portable induction cooktops to be at or around the size of a ruler for length and width. The depth of a typical portable induction cooktop is around 2-3”. Accordingly, since the length of a typical portable induction cooktop is around 10-13”, the cooking platter is typically also in this range. This is really the same size that you would find on most stove-top cookers, which means that it’s like taking a chunk out of your stove and being able to carry it around and store it away. How much should I pay for one of the best portable induction cooktops? The best portable induction cooktops are very affordable in most circumstances. If you want to purchase a portable induction cooktop that is built to last, you should be willing to invest more than $50. 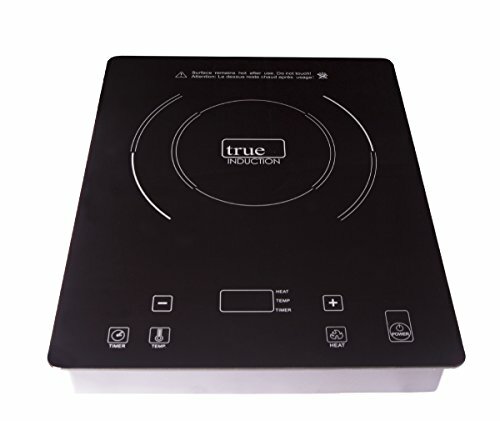 If searching for the most affordable portable induction cooktop is your goal, you are better off to go to a thrift store where you can get an induction cooktop for a ridiculously low price. However, if you want to purchase one of the best portable induction cooktops, you should expect to pay around $50-$150. Since prices for products can change without notice, this number may not necessarily account for natural economic factors such as inflation or the will of manufacturers. As a result, don’t expect this range to last for too long. What features should I expect in one of these products? Any of the best portable induction cooktops will typically have 1800W of power, multiple heating settings, or some sort of mechanism for controlling the temperature of the platter. Some of the fanciest portable induction cooktops will have other nice features such as LCD screens, automatic shutoff, and automatic temperature readings. You might also choose a product which counts down until you reach the desired temperature. Since you want your product to be portable, one of the most important features of any of the below products is a lightweight and slim design. Since each product can differ slightly on these dimensions, it is best to look at each individual product’s specifications below. Another nice feature that you might find on some of these products is the ability to heat up faster than a typical stove and boil water at a much faster rate. I hope my review of the best portable induction cooktops was helpful in deciding which one meets your needs in the kitchen. Portable induction burners are energy efficient and easy to use. Using the right inducti​​on ready cookware must be used and can be verified using a magnet.